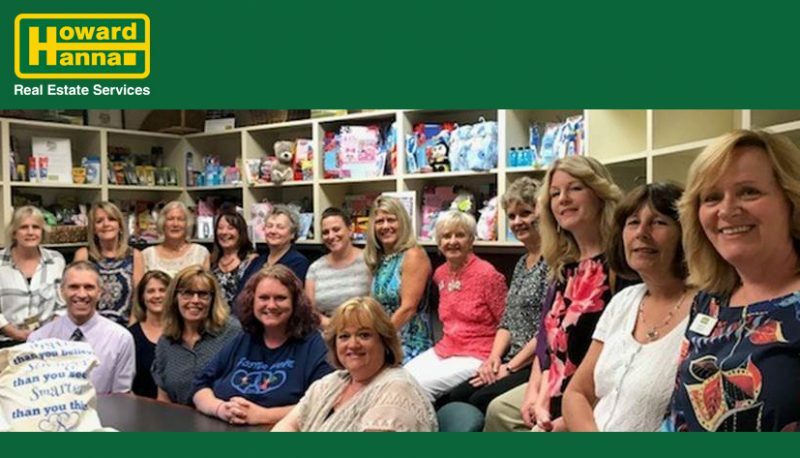 Medina, OH (August 9th, 2018) – Howard Hanna Medina agents and staff have opened their hearts and wallets to assist area children in foster care through Knapik’s Knapsacks. The office already has a proven track record of raising thousands of dollars for local children in medical need through the Howard Hanna Children’s Free Care Fund and was happy to gather in support of another local cause. Knapik’s Knapsacks was founded by Heather Knapik, a former foster child who moved through 18 different foster homes. She founded the organization with a mission to empower the more than 1,200 children who enter foster care daily with hope, dignity and love, one knapsack at a time. Many of these children have nothing more than a trash bag to carry their belongings as they transition between homes. Knapik’s Knapsacks provides each child coming into care locally with a large knapsack full of comfort and hygiene items, with plenty of room left for their most precious belongings. Realtor Sally Manuel, who had recently met the group and was moved by its mission, made a simple request that the agents in her office pick up one needed item while shopping. Overnight, her desk was overflowing with toothbrushes, toiletries, coloring books and crayons, nightlights, soft toys, and other things needed to fill the knapsacks. The Howard Hanna Medina office will continue collecting items for Knapik’s Knapsacks. Donations of throw blankets, stuffed animals, coloring books and crayons, shampoo, hairbrushes, toothbrushes and toothpaste can be dropped off at 3565 Medina Road, Medina, OH 44256. “Helping others in the community is a way of life for Howard Hanna Realtors,” concluded Thompson. If you have additional questions about donations, please contact the Howard Hanna Medina office at (330) 725-4137. Howard Hanna Real Estate Services is the 3rd largest real estate company in America, the #1 privately owned broker in the nation, and the largest home seller in Ohio, Pennsylvania and New York. The family-owned and operated real estate company specializes in residential and commercial brokerage service, mortgages, closing and title insurance, land development, appraisal services, insurance services, corporate relocation and property management. With 262 offices across OH, PA, NY, VA, MI, WV, NC and MD, our more than 9,200 sales associates and staff are guided by a spirit of integrity in all aspects of the real estate process.